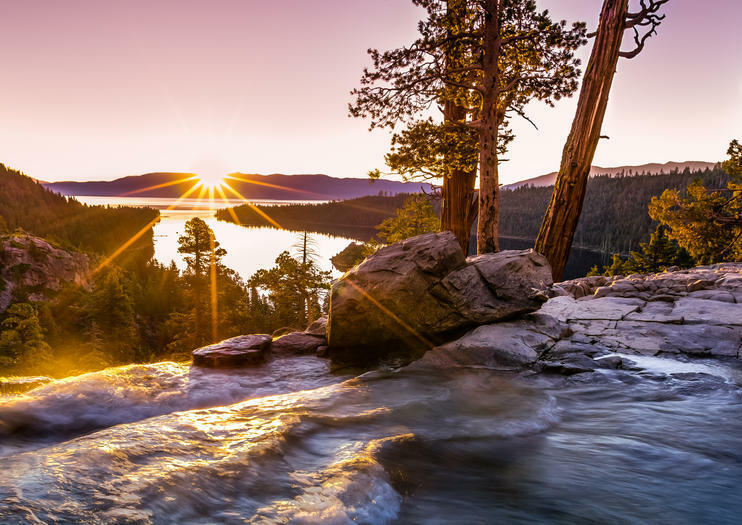 One of the most popular hikes in the Lake Tahoe area, the Eagle Falls Trail is an easy to moderate hike featuring cascading waterfalls, lush forest scenery, and breathtaking views of Emerald Bay, Lake Tahoe, and the Sierra high country. Experience the best that Tahoe has to offer in this short but rewarding hike. It’s only about 0.2 miles (0.3 kilometers) along an easy trail with stone steps to reach a lovely bridge overlooking Eagle Falls and Emerald Bay. There’s a loop trail heading back down at this point, but if you can, continue onward for another 0.8 miles (1.3 kilometers) through some steeper sections to Eagle Lake. Take a swim in the cold alpine waters if you dare, or enjoy a picnic lunch on the big boulders around the lake and enjoy the wonderful vistas. Dedicated hikers can continue even farther to reach Velmas, Dicks, and Fontanillis Lakes. Wear sturdy, comfortable shoes for the hike and bring plenty of water. You should be reasonably fit to hike to Eagle Lake; there’s a 400-foot (122-meter) elevation gain and the trail includes some steep and uneven steps. Obtain a wilderness permit at the trailhead if going past the falls. Restrooms and a picnic area can be found near the trailhead. When the parking lot is full, park along the side of the highway, but be careful of traffic and note that there are certain no-parking sections. Eagle Falls is located on the west end of the south shore of Lake Tahoe. From the intersection of US 50 and CA 89 in South Lake Tahoe, head north on CA 89 for 10.3 miles (16.6 kilometers) to the Eagle Falls paid-parking area. From Tahoe City, take CA 89 south for 18 miles (29 kilometers). The best times to visit Eagle Falls are in the summer and fall, when the weather is the most pleasant. Get here early during the peak summer season as the parking lot will fill up. It’s possible to visit in the winter, but there may be snow on the ground, and CA 89 is sometimes closed due to heavy snow or avalanches. The trail to Vikingsholm, a 1929 replica of a Scandinavian castle, starts on the other side of CA 89 from the Eagle Falls trailhead. The wide but fairly steep trail is about 2.5 miles (4 kilometers) round-trip. Tours of the castle are available from mid-June to Labor Day.